For the love of bunnies, zombies and frocks! : iZombie invades the small screen! 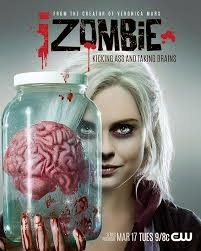 Hey BZF bandits, this past week has seen the interwebs alight with much discussion around the CW's newest series iZombie. Despite popular belief, iZombie is not about a viral Apple app that turns all its users into tech savvy brain munching zombies. Rather, the series is based on the comic book of the same name which was released back in 2010. I have often shared my thoughts on what has sometimes been called a saturation of zombie related content in film and television. The Walking Dead continues to go from strength to strength with a spinoff series due sometime this year, Z Nation has been green lit for a second season thanks to consistent ratings and Hollywood is constantly pumping out fresh zombie offerings on the silver screen. The key here is whether or not iZombie can set itself aside from the competition while delivering an engaging story and characters we are intrigued by. So far this seems entirely possible with the original creative team behind Veronica Mars at the helm who are taking the story of an intern physician (Olivia Moore) who can hide her 'zombieness' by eating a stable supply of brains. The twist with this show is that after Olivia has consumed some brains from her morgue buddies, she then experiences visions/memories of that particular person. On top of that, she also adopts some of their habits which ultimately helps her and her crime fighting friends solve the mysterious death of aforementioned morgue buddies.